Trading since 1986, Pro Solo offer a wide range of musical instruments, PA systems, accessories, tuition and repairs to professional musicians and new starters alike. Pro Solo know the importance of expert advice, excellent before and after sales service, great competitive prices and the necessity of being able to try before you buy in a relaxed, no pressure environment. As musicians themselves they aim to deliver this experience, in store and online, to all their customers. 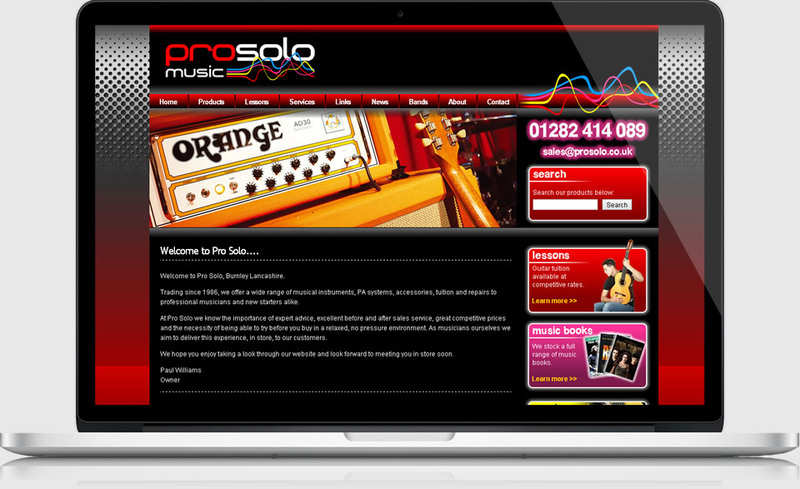 Pro Solo Music has been established in Burnley for as long as we can remember! 2010 saw a brand new redesign of the website and a brand new logo to go with the new site and to adhorn the shop. KreatureCMS based site and fully search engine optimised with excellent Google results. Brand new logo for branding and shop looks superb.